80 Hours of theoretical and practical learning! Upon arrival we will have a short Spanish test with you in order to find the course that best fits to your current level! It doesn’t matter whether you already have some knowledge or you are a beginner. You will see that your Spanish improves for sure! During your time, you’ll get to visit the beautiful surrounding cities. In Grenada are the beautiful Alhambra and the Gardens of Generalife. In Cordoba, the Mosque, Jewish district and Alcazar of the Kings. 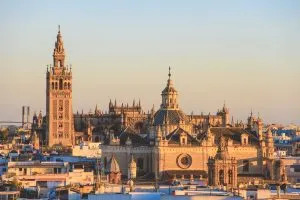 Seville boasts the Alcazar of Seville, Cathedral and “Gerald” and the archive of the Indias. Finally of course, the sights and sounds of Malaga, including Nerja, Marbella, Frigiliana and Antequera. The residential school “San Estanislao de Kostka” is specifically conditioned to host AFS Intercultura’s Summer Youth Camp as well as other groups from around the world during summer time. Classrooms will be converted into bedrooms during summer months so that this prestigious private school has all necessary facilities to host our group at a unique location close to the beach. During the rest of the year about 1.800 pupils are visiting this school. Its main building was built in the nineteenth century and officially opened in 1882. It was designed by the architect Jeronimo Cuervo. 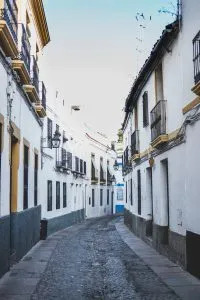 Within those 130years a lot of famous personalities have walked through the hallway such as the philosopher Ortega y Gasset, the writers Manuel Alto Aguirre o Antonio Gala as well as the famous painter Revello deToro, to name a few. The beach is only 5 minutes walk away from the school and close to the bus station to visit the City Center.